New Melbourne Browncoats, Inc. | It’s the end of a CSTS era… so let’s go out with a bang! CAN’T STOP THE SERENITY 2016 The CSTS Experience gets a little bit horrible with a bonus event on September 3! 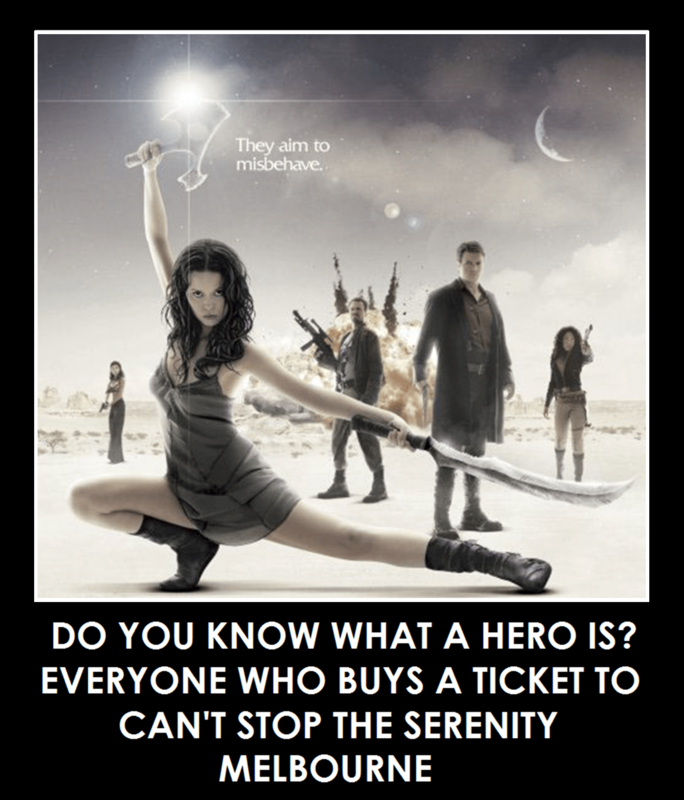 On August 13, we’re hosting the 11th Can’t Stop the Serenity Screening event in Melbourne… and it may well be the last. The NMB team has been working tirelessly over the years to bring this event to life, but attendance has been waning in the past few years. And this year, ticket sales are lower than ever. So if you’ve been meaning to attend our CSTS screening and have been thinking “well, there’s always next year”, then now is the time to get on board. We’d really like to go out on a high, and not only break even (cost wise) but make a significant donation to our two chosen charities – Equality Now and WIRE. Hosted by the amazingly funny Ben McKenzie, the fun kicks off at 10am on August 13 and will include live entertainment, cosplay contest, screening of Serenity and more. There will also be lots of prizes up for grabs in our raffle and auctions (including a Serenity poster signed by Joss Whedon!!) and a lucky attendee will win a $100 Village Gold Class Gift Card! Tickets and event packages (with swag!) can be pre-purchased online from $25, and our CSTS Passenger Pass ($25) will be available at the door. We’re also excited to be announcing that there will be a second special related event that will be exclusive to CSTS Screening ticket holders featuring something we haven’t been able to include in our events for some time… and you won’t want to miss out! More news on that will be released on Sunday but those who purchase tickets now will be given advance notice to secure your seat. So please join us for the final of our annual Can’t Stop the Serenity Screening event, and help us make this one a success!